Today, if Vallon is your destination, you have to turn off the main road to Sixt and head for the foot of the Criou mountain. Here, you will catch the first glimpses of a community so unusual that it was awarded the title of "Area of Architectural, Artistic and Historic Interest". Although modern buildings are beginning to encroach on this area which was originally used for farming, it has retained much of the character of the old agricultural community. To withstand an often hostile environment, the farms were built close together to reinforce their owners' feeling of safety. The construction materials used were often very similar, as were the design and layout of the buildings, yet the architecture is far from uninteresting ! As you stroll through the village, look at differences in the balconies with their rectangular bars or traceried balustrades. Note the alternating use of stone and wood and the air vents in the haylofts above the houses. Two commas can be combined to form bulls' horns, hearts or flames, four commas create a curved crucifix. Other buildings display the suits from a pack of cards. A closer look at the doorways, columns and carved lintels gives an indication of the villagers' tastes- behind the apparent austerity there is a simple, discreet beauty steeped in tradition. A walk through Vallon reveals a community that was originally built up around a cheese factory, which used the milk collected every day from the farms in the winter and from the pastures on the Criou in the summer. Central to bringing this community together were the fountains where people would gather to draw their water and where sheep would stop to drink. One fountain sprang from a tree trunk, another gushed from a stone column skilfully decorated by one of the village sculptors, François Mugnier. The main centre of Vallon, however, was the 17th-century chapel with its Baroque-influenced octagonal bell tower and onion dome. Dedicated to the Apostles James, Philip and Joseph, it was built in 1636 to give thanks for the end of an outbreak of plague. Other perils through the centuries faced by the villagers of Vallon, were avalanche, fire and flood. In 1831 an avalanche poured down the slopes of the Criou and deposited a deep covering of snow that reached up to the bell tower of the chapel and lasted until the 15th August that year. More recently, in 1999, another avalanche stopped just short of the chapel. 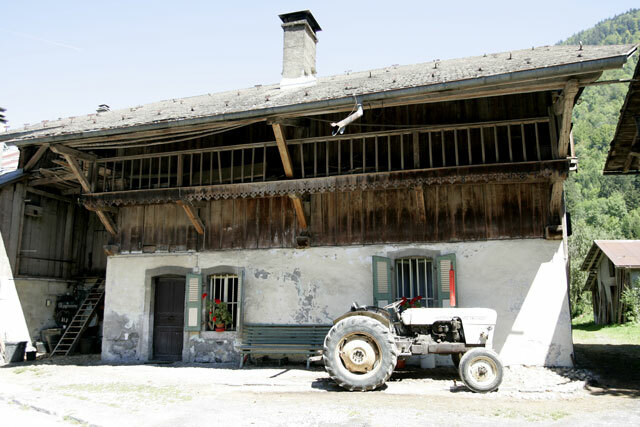 Fire was an ever-present danger to the farm-houses, which were constructed primarily of wood. It could spread rapidly through the closely-built dwellings with their outbuildings full of stored hay. Flooding was another regularly occurring hazard requiring constant surveillance until the Giffre and Clevieux were dammed, thus lessening the risk. A walk through the community of Vallon is a journey back in time, when life turned with the seasons, people worked the land and thrived, despite sometimes suffering great hardship. The Fer-à-Cheval Cirque is one of the most spectacular corners of the French Alps.